Suckling was born at Whitton, between Twickenham and Hounslow, Middlesex, on February 10, 1609. His mother died when the boy was four years of age, in 1613. His father, descendant of a prominent Norfolk family, was appointed Comptroller of James I's household in 1622. Suckling matriculated at Trinity College, Cambridge in 1623 but left without taking a degree in 1626. Suckling inherited extensive estates on his father's death in 1626, and was admitted to Gray's Inn in 1627. Just eighteen years old, he pursued a military and ambassadorial career in the Low Countries, and joined the English soldiers serving in the army of Gustavus Adolphus during the Thirty Years' War. Suckling was knighted in September 1630. He returned to the English court in May, 1632, where he became very popular through his wealth and charm. He was known as a gamester, and is credited with having invented the game of cribbage. In 1637, Suckling wrote the prose work Account of Religion by Reason. His play, Aglaura, was published in 1638 and performed twice for Charles I. The play had two different endings, one tragic and one happy. It was not a critical success, but it introduced the wonderful lyric poem "Why so pale and wan, fond lover?" In the same year, Suckling's comedy The Goblins was published. It was much influenced by Shakespeare's The Tempest and is generally thought to be Suckling's best. In 1639, Suckling recruited and equipped cavalry to help King Charles I in his first Scottish war. He was ridiculed in London for the troops' scarlet uniforms and plumed hats, but he was well-favored by the King. 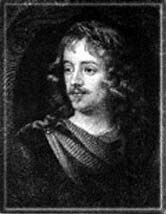 In 1640, Suckling sat in Parliament for Bramber and took part in an unsuccessful action against the Scots. In May, 1641, Suckling took an acitve part in the royalist plot to rescue Strafford from the Tower. When Parliament ordered him to account for his movements, Suckling fled through Dieppe to Paris. He died in Paris a few months later, in 1642, either from suicide by poison, or, as another tradition has it, by the hand of a servant who placed a razor in his boot. New York: W. W. Norton & Company, 1993. 1704-5. The Cavalier Poets: An Anthology. Thomas Crofts, Ed. New York: Dover Publications, Inc., 1995. 51. Jokinen, Anniina. "The Life of Sir John Suckling." Luminarium.